Cannibalistic herons, moorhen victims and lapwing police sirens at the winding hole – The Diesel-Electric Elephant Company. My goodness me, I am beginning to Twitch. Woats and steasels and wabbits are too bright to venture out in this sort of dismal weather with the cold and the wind and the thick, grey clouds, and it is the feathered wildlife that has been making itself well and truly known of late. There’s sparrow-poop all over the Cardinal for one thing but that’s not what it is to what I are alluding, Shakespeare me ol’ fruitbat’s willy-warmer. Nope. For the past few days I have noticed a pair of “things with wings” flapping around in the fields either side of my mooring – and they make a sound like some foreign police-car siren. Lapwings, are they, my researches tell me, little one. Try out the audio file on this link. The sound is well worth a listen, it’s very unusual. Here’s another recording. Both this link and the RSPB one left as “messy” so that you can see where you might be going. An altogether more quiet wee beastie has been Mr Heron, prowling the far bank (“far” being about fifteen feet). Not the best photographs, but taken through rain-splattered window-glass and you’ll needs must make do. The old man, like ducks, is not the least bit fooled by my one-way reflective blue windows – he can see right in and is well aware that I am watching him. Their eyes must operate on a different bandwidth of light and/or be polarized in some fashion, a bit like sunglasses. I’ve seen plenty of heron fishing tactics before, and they are amazingly efficient and effective, only diving in when absolutely certain of a tasty finned morsel. What I didn’t realise however, was that herons also eat other birds and small children. Nor have I seen them before wading in the shallows, searching for nests and fish. Here he is up to his thighs in canal, and he’s just spent an awful length of time rooting about in the undergrowth where I know for certain that there is (was?) a moorhen nest. I didn’t see any obvious signs of eating, but then I don’t know whether herons wiggle their bum when chewing on tasty young moorhen/egglings on the nest… and most of the time, his bum poking out of the foliage is all that there is to see. An accurate metaphore for life in general, I suppose. I haven’t seen the adult moorhen since, but I’ll report if and when I do. I like herons, but I am rooting for the moorhen (it being the smaller and harder-working of the two). Nature, red in tooth and claw and knife and fork. 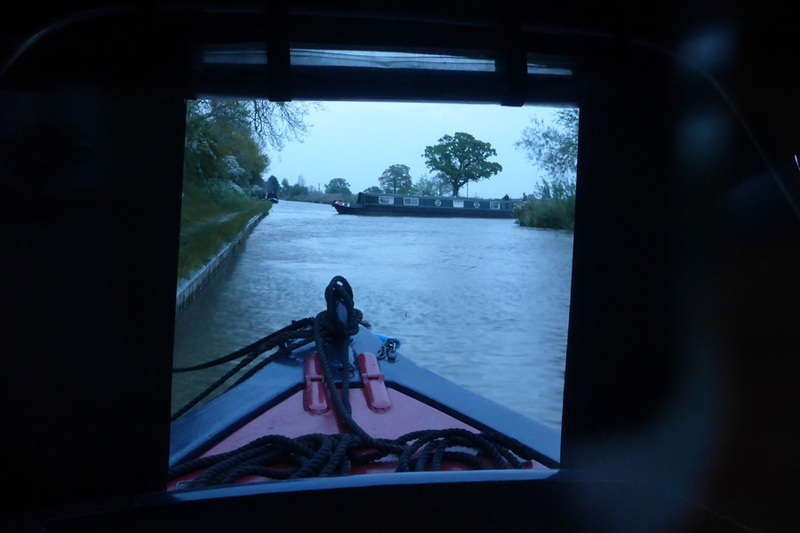 The other sport while I am moored here on the Middlewich Branch is the watching of the winding hole. English winding holes are almost as much fun as African watering holes. A winding hole (pronounced as in “they call the wind Maria”) is a specially-widened bit of canal where narrowboats can wind or “turn around”. Narrowboats are not like cars or stoats or weasels, there’s no steering wheel, no handy-brake and little telling where, when windy, the wind will take them. Turning them around is an art form. Sometimes I can manage it well and with artistry, but my last turn was a thirteen-and-a-half pointer… with a misery-guts of a “serious” fisherman as witness. This is a hire-boat getting it all wrong… for one thing, it is highly UNrecommended practise to bung one’s business end into into the shallows. If you’re going to get grounded then tis best to get the bow grounded and not the prop and rudder. They made it eventually though. I’m not laughing as I watch other people screw up – I am watching to learn, to see what works and what most definitely does not work. Alright, I giggle once in a while, but schadenfreude is part of life and is unavoidable if you have human DNA. I’m certain that lots of folk have giggled (and hooted in derision) at my antics. The aforementioned “serious” fisherman didn’t, but then I doubt that he’s laughed since the day he was born (and even then it was probably just a baby-burp masquerading as a guffaw when the midwife made an easy mistake and slapped his face instead of his arse…). Slowly and with aforethought and using all of the available room seems to be the best formula. I’m sure that we all approach winding holes with that in mind, and then the must-do-this-quickly-right-now panic takes over. Bags of revs and rooster-tails from the prop are not the answer though, this I can say for sure. There’s also a natural law on the canals that the moment you commit yourself to trying to turn around a boat then two or three other boats immediately appear on the horizon, steaming towards you. There will also usually be some cleverdick watching you from behind one-way glass. The self-same cleverdick that will himself be turning his sparrowpoop-laden boat in that hole in a few days time – under the steely-eyed, polarized gaze of two lapwings, a bereaved moorhen, an over-fed heron and a random duck. Damn. I know lots of birds now. Grebe (winter plumage). Heron (bloodstained overalls). Moorhen (funeral blacks and/or widow’s weeds). Lapwing (northern, Vanellus vanellus) (anyone remember Milli Vanilli?). Seagull. Hen. Ostrich. Madonna. Honest, Occifer, these binoculars are for bird-watching. If people leave their curtains open it’s hardly my problem. That’s quite enough twitchery-watchery for one day. It’s a wet, windy and dull day too, so my next task is luncheon. Luncheon today is a curry. Whoop whoop-whoop weeep, bloop, whoop-whoop weep. No, you’re quite right, I have no idea how to imitate a lapwing call in English. Previous A mooch, a pootle, a derelict, two horses and a shudder. The formula for moving. Birds are my favourite wild things, I just love them. Thank you for the links, it is a long time since I heard Lapwing though I see them quite often on our countryside perambulations. In Scotland last week we saw three Heron in a field and an oyster Catcher on top of a Scots mountain, we usually see them at the edge of the sea! Those are really good pics through a window and may I be the first to congratulate you on the cleanliness of the glass – you make a damned fine housewife/person! I pay to have my outers done but my innards are a bit dodgy! Jolly good piece and the bird calls quite an education.